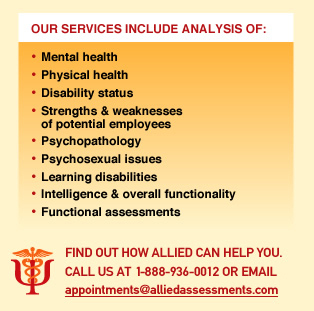 When your organization is in need of medical and psychological evaluations, you need the professional opinion of physicians and psychologists who are dedicated to providing thorough and customized evaluations. We began building our organization with this philosophy: As medical and psychological evaluations become more and more commonplace, every organization deserves customized testing and prompt, detailed results from qualified professionals. With the way our world moves, you don't have time for anything else. Allied Assessments, Inc. can determine which battery of tests is most applicable to your needs and provide the required assessments. We look forward to becoming a resource for you.